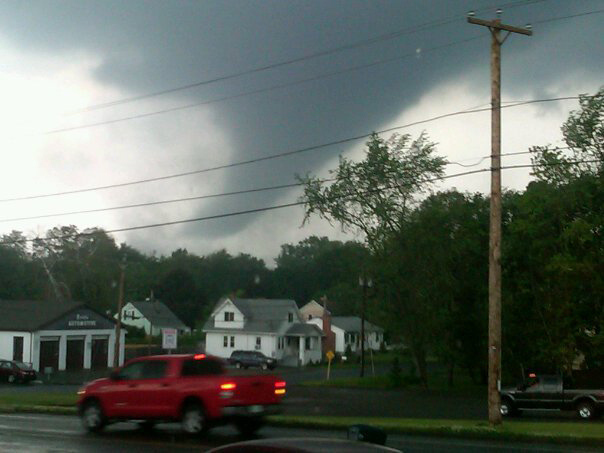 At least two confirmed tornadoes descended upon towns in western Massachusetts on Wednesday, leaving at least four dead and smashing homes and buildings across a 40-mile stretch, state officials and witnesses reported. The storms struck shortly after 4 p.m. in Springfield, about 90 miles west of Boston. As many as 19 communities reported tornado damage Wednesday evening. The governor declared a state of emergency as the storm system that spawned those twisters moved east, with watches posted all the way to the Atlantic coast until late Wednesday. 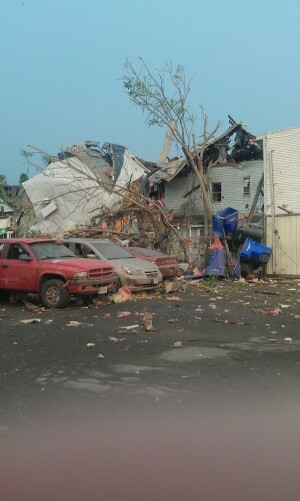 It's been particularly devastating in downtown Springfield. Springfield, Monson, Westfield and seven other towns - Agawam, Charlton, Oxford, Palmer, Sturbridge, West Springfield and Wilbraham - reported severe damage. Massachusetts Electric Co. reported that 12,000 customers were without power in the utility's service area and that hard-hit areas might not have electricity until the end of the week. 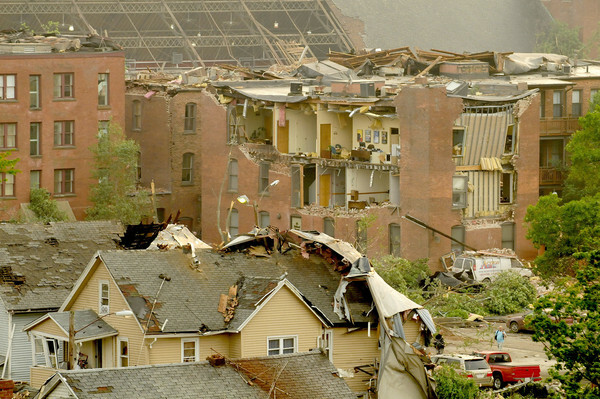 1,000 National Guard troops have been mobilised to assist with cleanup and search-and-rescue operations. 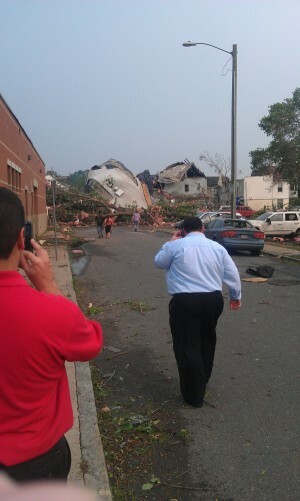 The Massachusetts State Police said it had activated dog teams to look for people in damaged buildings and described many streets in Springfield as "impassable" due to fallen power lines and trees. 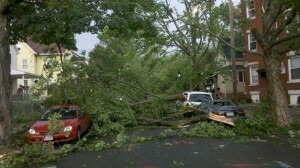 The damage came amid a wave of heavy thunderstorms that moved through the Northeast on Wednesday afternoon. Tornado watches were also issued for northern Connecticut, Rhode Island, New Hampshire and Maine until 11 p.m. Wednesday. 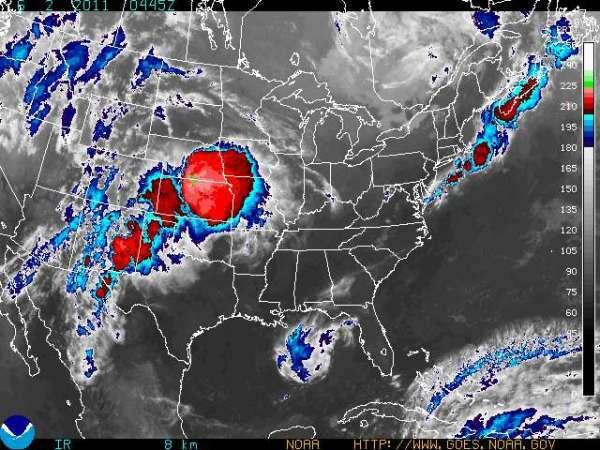 At least 17 tornadoes were reported on Wednesday in Massachusetts, Kansas, Nebraska and California. 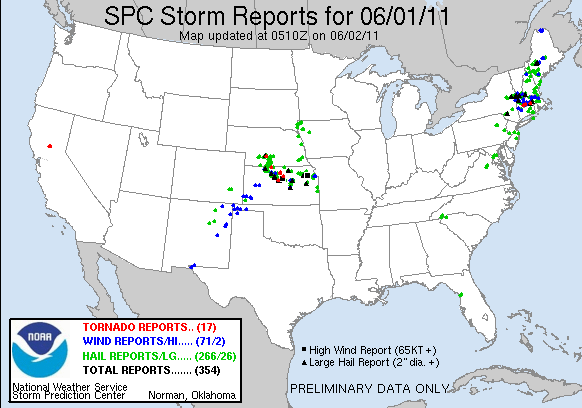 Some 354 severe weather reports received by SPC on June 1 included 17 tornado sightings in 4 states, as of posting. kathrin commented on The Watchers: Still can´t figure out if those hurricanes are manmade or a result of the earth wobbling due the effect of some big thing outthere in the solar system, any clues about this?